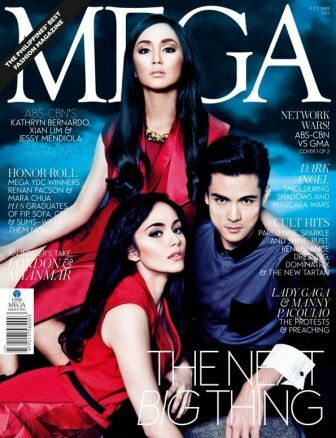 Brightest Kapamilya Young Stars on 'The Next Big Thing' Edition of MEGA Magazine! MEGA magazine gives two covers of their July 2012 issue. Their theme for the month is called "The Next Big Thing" which features the brightest and the hottest young stars from the Kapamilya and Kapuso network. In the Kapamilya version of the said mag, Kathryn Bernardo, Jessy Mendiola, and Xian Lim graced the cover. Kathryn is currently leading the primetime TV series "Princess and I," pairing her with Enrique Gil, Khalil Ramos, and Daniel Padilla. Meanwhile Xian and Jessy is prep to star in the upcoming ABS-CBN TV series. Xian rejoins Kim Chiu in the upcoming drama series "Ina, Anak, Kapatid" with Maja Salvador and Enchong Dee while Jessy is set to star in PHR "Isla" with Matteo Guidiceili.